Angel Tree is a unique holiday assistance program that connects a generous individual or group with a deserving child (or “Angel”) in need. The sign up period for assistance was October 22nd-November 2nd. Angels’ gifts will be ready to pick up on distribution day in mid-December. Angel adoption takes place after Thanksgiving until December 8th at Castleton Square Mall, Greenwood Park Mall, and the Indiana History Center in downtown Indy. In fact, the program is expanding! In 2018, The Salvation Army Indiana Division and United Way of Central Indiana (UWCI) announced plans to expand its Angel Tree initiative by adopting United Christmas Service, United Way’s long-running holiday assistance effort. Beginning this holiday season, the Salvation Army’s Angel Tree program will fulfill the wishes and basic needs of children in Marion, Hamilton, and Johnson County. Every Christmas there are children lacking vital needs because their families are struggling financially and cannot afford the expense. The Salvation Army’s Angel Tree program has been running for more than 30 years to ensure that these children have a wonderful holiday season with their families. The Salvation Army Indiana Division has been providing Christmas assistance to our community for generations. In an effort to expand our ministries to provide both vital needs and a joyful Christmas to underprivileged children, we were proud to introduce Angel Tree to Central Indiana in 2015. Many children in our community return to school after the holidays in worn out uniforms, insufficient winter clothing, or needing school supplies replenished. Angel Tree is a traditional Salvation Army program designed to enable community members to personally provide these vital items to specific children in need. How is Angel Tree different from other holiday programs? 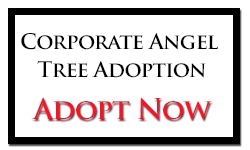 Angel Tree is different from other holiday assistance programs because a sponsor is able to feel a special connection with his/her “adopted” child. The sponsor receives the child’s first name and a personalized needs and wish list for the child. Other holiday assistance programs give sponsors minimum information such as “5-year-old boy” without any gift suggestions or host generic toy drives. The wish list given to the sponsor is thoughtfully prepared by the child’s parents so the sponsor knows that he/she is buying something the child both needs and will be excited to open on Christmas morning. How can I become an Angel Tree volunteer? As you can imagine, it takes hundreds of volunteer hours to make Angel Tree happen. From helping shoppers adopt Angels at the mall to sorting bags and helping families on distribution day, volunteers are essential to a successful Angel Tree program. To learn more about how individuals, families, groups and businesses can help, please reach out to Stevi Cochrane at Stevi_Cochrane@usc.salvationarmy.org. How can I donate Online to the Angel Tree program? Where can I go to adopt an Angel? Angel Trees will be on display in Castleton Square Mall, on the north side of Indianapolis, and Greenwood Park Mall, on the south side. The dates for our 2018 adoption period are November 16th and 17th and then November 23rd through December 8th. Shoppers will be able to choose an Angel from a tree from 11am - 7pm each day. They are given special Angel Tree bags to be filled with gifts for their Angel. Each Angel tag includes a child’s age, clothing and shoe sizes, “wants” (like toys or games) and “needs” (like jeans or boots). Once filled, the bags can be brought back to the Angel Trees, which will be set up at the south entrance of Castleton between Forever 21 and H&M and just outside the Macy’s mall entrance at Greenwood. Any bags not returned to the mall by 7 PM on the last day of adoptions can still be dropped off at The Salvation Army’s Indiana Headquarters at 6060 Castleway West Drive on Indy’s northeast side until 4 PM the following day. Back this year, a special Angel Tree will be on display in the lobby of the Eugene and Marilyn Glick Indiana History Center at 450 W. Ohio Street in downtown Indy. As part of the annual IHS Festival of Trees, the tree will both tell the history of The Salvation Army in Indiana and host hundreds of Angels for festival attendees to adopt. Filled Angel Tree bags can be brought back to the Indiana History Center or dropped off at Salvation Army headquarters. If you want to adopt an Angel before November 16th please contact Deena Ford at Deena_Ford@usc.salvationarmy.org. Contact Captain Brianne Bowers at Brianne_Bowers@usc.salvationarmy.org with any questions you have about Angel Tree.